Endocarditis of the right heart related to a pacemaker is a serious complication. In this regard, we report a case of a patient aged 59 which is characterized by the occurrence of this complication a very long time after implantation of the materiel. In this patient, the diagnosis was delayed due to untimely antibiotic therapy. Infectious endocarditis of the right heart on pace maker is a rare complication reported in 2% of cases 1. It can be serious life-threatening reaching a mortality rate of 35% 1. In this regard, we report a new case with a very long delay of diagnosis. A 59-year-old patient who was a farmer by occupation was admitted in 2016 to our department for exploration of a 6 month history of prolonged fever. The patient recorded fever at 38.5 to 39°C especially in the evening. She reported night sweats, anorexia and weight loss. She had a history of implantation of a double chamber pacemaker for a Mobitz II atrioventricular block in 2008. She had habits of ingesting unpasteurized raw milk. Because of her job, she was in contact with domestic animals and their abortion products. Since the start of symptoms, she consulted several times. The last received treatment dates back to 1 month before hospitalization. It was based on an association between ciprofloxacin (1 g / day), amoxicillin clavulanic acid (2 g / day) and metronidazole (750 mg / day), given for 10 days. Clinical examination revealed a well appearing woman. She was afebrile (rectal temperature: 37.5°C). The fever was not objectified during her hospitalization. She had poor dental hygiene with several dental snags. Her hemodynamic status was stable with a blood pressure of 120/80 mmHg and a heart rate of 85/min. Cardiac and pulmonary auscultation was normal. The urine dipstick was normal. The pacemaker’s lodge was clean. There was no hepatosplenomegaly. There were no palpable lymph nodes. The remainder of the physical examination was unremarkable. At the ECG, the rhythm was electro driven at 60 cycles / min. Laboratory findings showed normal hemogram (white blood count: 9950 /mm³, neutrophils: 7150 /mm³, lymphocytes: 2010 /mm³, hemoglobin: 12.3 g/dL and platelet count: 260000 /mm³). She had a discrete biological inflammatory syndrome (erythrocyte sedimentation rate: 45 mm, C-Reactive protein: 54 mg/L, plasma fibrinogen: 4.19 g/L). There was neither hyper alpha 2 globulinemia (9.5 g/L) nor hyper gamma globulinemia (10g/L). The hepatic and renal function tests were within normal limits. Uroculture and blood cultures were negatives. The chest x-ray was without abnormalities and the pacemaker was in place. Infectious investigation (acidoalcoolo-resistant bacillus on the sputum, serological testing for Wright, Vidal, Epstein Barr virus, cytomegalovirus, parvovirus B19, hepatitis C and hepatitis B virus) was negative. The abdominal and pelvic ultrasound was without abnormalities. Transthoracic ultrasonography showed a 35 mm x 17 mm multi-lobed mass in the right ventricle compatible with vegetation (Figure 1). This mass appeared to fit on the right atrium side wall and the posterior tricuspid valve implant base. It seemed to be inserted into the side wall of the right atrium and the base implantation in the posterior tricuspid valve. It prolapsed in the right ventricle through the tricuspid orifice. The pacemaker probe was sheathed in this mass. Transesophageal ultrasound showed the same aspect. The diagnosis of right-sided endocarditis on pace maker was retained and the patient was transferred to cardiovascular surgery. 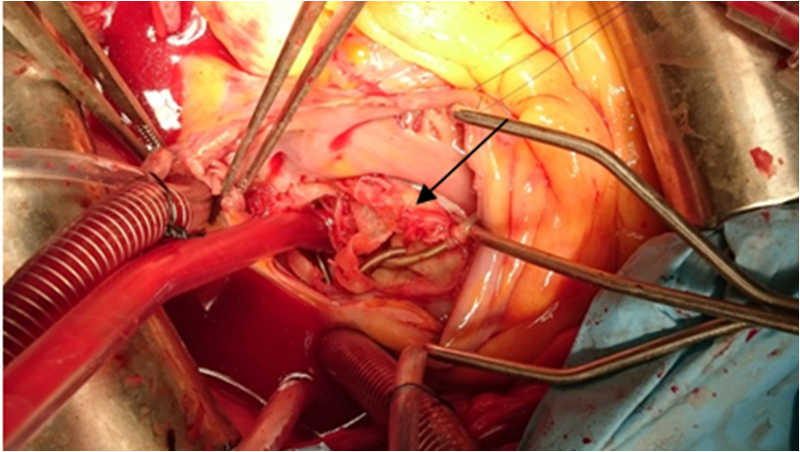 Macroscopic examination during surgery showed a typical appearance of vegetation related to infective endocarditis (Figure 2). Patient underwent a successful tricuspid plasty with vegetectomy. The old pace maker was replaced by a new epicardial pace. Probe cultures were contaminated and vegetation cultures were negative. She received triple anti-staphylococcus antibiotherapy with good evolution. Our observation is characterized by endocarditis of the right heart occurring after a very long delay, 8 years after the implantation of the pacemaker. Long delays were reported after 12 months in 12% of cases. 2, 3. A very prolonged period of up to 10 years is exceptional 2, 3. The awakening of an infection related to the implantation of the pacemaker or more rarely by the bacterial transplant in the event of a bacteremia would explain these late delays. 3. In our case, the absence of objectified fever during hospitalization and the existence of a minor biological inflammatory syndrome were contrasting with the presence of enormous vegetations. This is probably explained by antibiotic therapy that would have decapitated the infection. In the literature, staphylococcus is the most commonly implicated germ found in 68 to 93% of cases. Gram-negative bacteria are found in less than 18% and infectious endocarditis with negative blood cultures are observed in 15% of cases 1. Fungi microorganisms have been also described as responsible for pacemaker endocarditis 4. In our case, blood and vegetations cultures were negative due to antibiotic therapy. Nevertheless, bacteremia of Brucellian origin remains controversial in our patient considering the notion of consumption of raw milk and contact with abortion products. The negativity of for Wright’s serological testing may be related to the use of ciprofloxacin in our patient. When dealing with patient with pacemaker, in the presence of any prolonged fever or even a minor biological syndrome, endocarditis should be investigated. Sandoe JAT, Barlow G, Chambers JB, Gammage M, Guleri A, Howard P et al. guidelines for the diagnosis, prevention and management of implantable cardiac electronic device infection. Report of a joint working party project on behalf of the British society for antimicrobial chemotherapy (BSAC, host organization), British heart rhythm society (BHRS), British cardiovascular society (BCS), British heart valve society (BHVS) and British society for echocardiography (BSE). J Antimicrob Chemother 2015; 70(2): 325-59. Meune C, Arnal C, Hermand C, Cocheton JJ. 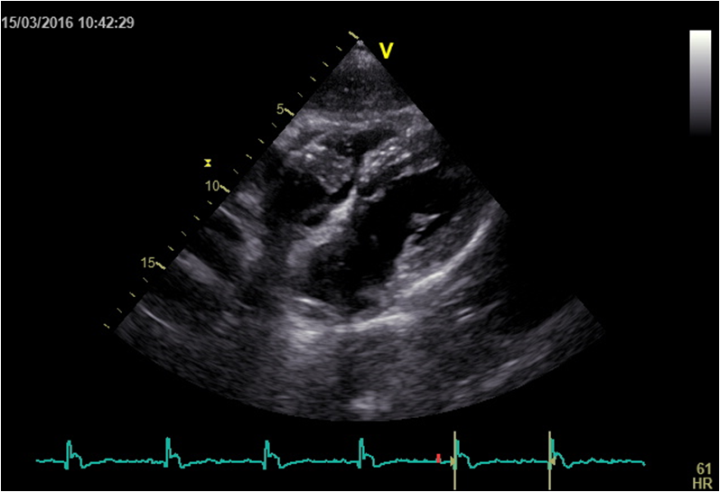 Infective endocarditis related to pacemaker leads. A review. Ann Med Interne 2000; 151: 456-64. Klug D, Lacroix D, Savoye C, Goullard L, Grandmougin D, Hennequin JL et al. Systemic infection related to endocarditis on pacemaker leads: clinical presentation and management. Circulation 1997; 95:2098-107. Mangoni ED, Nappi G. Giant endocarditis vegetation on a pace-maker lead. Intern Emerg Med 2010; 5: 251-2. Kechaou, Ines, et al. "Endocarditis of the Right Heart Long Time after Pace Maker Implantation." American Journal of Medical Case Reports 6.7 (2018): 132-133. Kechaou, I. , Ouechtati, W. , Cherif, E. , Boukhris, I. , Chenik, S. , & Hassine, L. B. (2018). Endocarditis of the Right Heart Long Time after Pace Maker Implantation. American Journal of Medical Case Reports, 6(7), 132-133. Kechaou, Ines, Wejdene Ouechtati, Eya Cherif, Imene Boukhris, Slim Chenik, and Lamia Ben Hassine. "Endocarditis of the Right Heart Long Time after Pace Maker Implantation." American Journal of Medical Case Reports 6, no. 7 (2018): 132-133. Copyright © 2012-2018 Science and Education Publishing Co. Ltd All rights reserved.